Food for Hungry Minds Schools are established to serve children living in poor communities. The goal of creating an education system, which serves children from Grade 4 through Grade 6, is to provide less privileged children with an intensive three-year, bilingual education that prepares them to succeed in good high schools and serve in life. How is it that, in a few years, some of a community’s poorest children are able to converse in English with international donors and achieve grade level standards? Food for Hungry Minds schools adopt educational best practices to continually support and challenge children to learn. Food for Hungry Minds focuses on student achievement, tracking results in Math, English, and Science with regular, independently-administered testing. Food for Hungry Minds parents make a commitment to be involved in their children’s education and in school activities. Parents, supported by the local community development organization, attend trainings, assist on a rotating basis in things like serving meals or covering books and ensure that their child is ready for school each day. When the child has no available parent, community volunteers contribute time for the child. The intensive program supports student growth with small class sizes. With a low student/teacher ratio, individual students move forward as they achieve mastery. Students are in school for over eight hours each day, except for shortened teacher-planning days. Each day starts with two hours of language arts focus, followed by an extended math class. 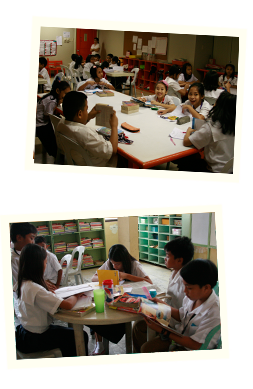 Students carry their learning home with educational activities like reading books to siblings on weekends. A summer learning program, camp, and field trips, as well as connections with sponsoring employees, expand the experiential context of learning. Aside from providing quality basic education, Food for Hungry Minds provides students with all books and supplies, uniforms, transportation, two meals a day, as well as medical and dental assistance, as an integral part of ensuring academic success. Ongoing partnerships and education charities among those bringing varying expertise has supported the development of the program. This community approach allows children facing overwhelming odds to succeed in their academic and holistic education. Teaching practice includes the research-based SIOP methodology. With the Read Naturally program, students work on reading fluency while listening to native English speakers. Materials are adapted with culturally appropriate reading selections.